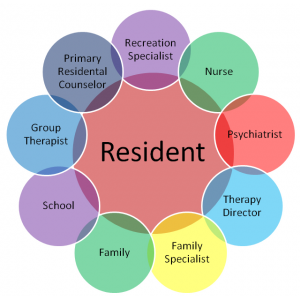 A group of clinical professionals surround each resident and comprise his or her clinical treatment team. The Family who knows the resident the best and can provide the needed information and insight into the treatment planning process. The Child Psychiatrist who directs the clinical care of each resident. The psychiatrist meets with each resident every week. The Therapy Director who oversees the clinical work performed by the Family Specialists and Primary Residential Counselors. This oversight ensures continuity of clinical care for each resident. The Family Specialist who facilitates weekly family and individual therapy sessions with their assigned residents from the admission to discharge. Additionally, a Family Specialist also facilitates group therapy with the residents. The Primary Residential Counselor who works daily with residents providing behavioral sessions and interventions. The Education Coordinator who provides schooling for the residents. The Nurse who provides medical oversight of the residents. The Recreation Department who provide recreational activities to the residents.